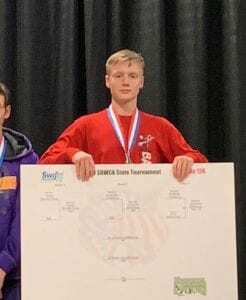 Brayden Schlachter (Michael and Julene) wrestled freestyle in the Elite division of the AAU wrestling tournament in Brookings on Friday, March 15. He won the championship at 126 pounds in his division. He is a sophomore at Gettysburg High School.